The submersible mixed-flow column pump type ABS AFLX equipped with an IE3 motor is designed for use where large volumes of process water or wastewater containing solid effluent must be pumped up to moderate heads. Premium Efficiency motors combined with efficient three- to five-blade mixed-flow impellers with low NPSH characteristic impeller design, ensure high reliability and efficiency. Axial-Flow Pumps equipped with Premium Efficiency IE3 motors ranging from 7.5 to 650 kW for 50Hz. Sulzer has a deep knowledge in wastewater treatment, and with our wide product portfolio we can now offer energy-efficient and reliable solutions for your water collection, neutralization, flocculation, sedimentation, cooling, aeration, sludge storage, digestion, and dewatering processes. Meeting today’s challenges and high requirements within water intake, sedimentation, sludge treatment, fine screening, and water distribution processes. 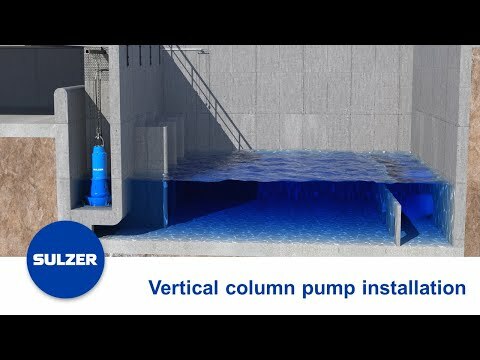 Vertical column pump installation - how to realize an optimum pumping station.